The Skinny: Entertaining action-thriller that feels too implausible to be more than a passing time-waster. by Kozo: A surprisingly dark and gritty crime thriller that taxes your sympathy as five of the best cops in Hong Kong take some dirty drug money and proceed to watch everything go to hell. TVB’s Five Tigers (Andy Lau, Tony Leung, Felix Wong, Miu Kiu-Wai) play four of the tigers, with Leung Ka-Yan as their captain. The fifth TVB tiger (Ken Tong) doesn’t play one of the good guys - he instead plays the viciously evil bad guy Tung. 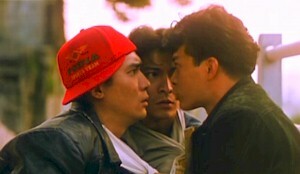 During a routine drug bust, Leung Ka-Yan lets Tung go because he was once his brother-in-law. Tung lets the cops have $10 million HK dollars, and in probably the film’s biggest suspension of disbelief, the five cops take the money. All except Felix Wong, that is, who manages to be righteous even while his cop brothers take the money with varying degrees of guilt. Sadly, the whole thing goes insane as Tung returns to blackmail the cops, and each step they take to stop Tung is met with an increasingly depressing darkness.